Nagasaki. Laid down at Mitsubishi Zosensho K.K. as Yard No. 424, a 2,594-ton passenger-cargo ship for Osaka Shosen K. K. (OSK) Line, Osaka. Launched and named CHOJO MARU. In OSK’s Japan ~ China service with ports of call at Kobe, Moji and Tientsin, China. Requisitioned by the Imperial Army (IJA). Allotted IJA No. 834. At 0800, CHOJO MARU departs Palau in convoy No. 3211 also consisting of KINE and SHINRYU MARUs escorted by destroyer SANAE. At 1500, CHOJO MARU departs Manila escorting a convoy also consisting of SHONAN MARU escorted by minesweeper W-8. CHOJO MARU departs Takao for Moji in convoy “D” also consisting of HAVRE, KONSAN, SHINKYO, TAINAN, TAJIMA, TEIFU (ex-Vichy French BOUGAINVILLE) and SHONAN MARUs and one unidentified merchant escorted by destroyer SANAE. SHINKYO MARU is detached at Sakito. CHOJO MARU departs Moji in convoy No. 187 also consisting of ATAGO, HONAN, KIYO, KOYU, KOFUKU and RAIZAN MARUs, fleet oiler SHIRIYA and four unidentified merchants escorted by destroyer KARUKAYA. 22 August 1943: CHOJO MARU departs Mako in convoy No. 317 also consisting of KACHOSAN, KAIKO, KOYU and RYUKO MARUs, tankers KIYO and YAMAMIZU MARU No. 3 and four unidentified merchants escorted by patrol boat PB-2. Arrives at Samah, Hainan Island, China. At 0905, departs Saigon, Vichy French Indochina (Ho Chi Min City, Vietnam. At 1225, arrives at St Jacques. CHOJO MARU departs Zamboanga, Philippines in a convoy also consisting of HINODE and MINRYO MARUs and YOSHIDA MARU No. 3 escorted by patrol boat PB-103. At 1000, arrives at Cebu. At 0830, arrives at Manila. CHOJO MARU departs Moji in convoy No. 131 consisting of AKAGISAN, ARABIA, HAWAII, NORFOLK, TOTTORI and USSURI MARUs and three unidentified merchant ships escorted by subchasers CH-41 and CH-43. The convoy carries elements of the IJA 147th Infantry Regiment, 46th Division including regimental HQs, 1st, 2nd and 3rd Battalions and the regimental artillery battalion. CHOJO MARU departs Cebu in convoy H-17 also consisting of IJA transports ODATSUKI and NAGATA MARUs escorted by auxiliary subchaser KYO MARU No. 2. CHOJO MARU is carrying more than 800 soldiers and sailors. At 2102, LtCdr Donald F. Weiss’ (USNA ’29) USS TINOSA (SS-283) torpedoes and sinks ODATSUKI MARU carrying war supplies at 09-15N, 127-00E. Six crewmen and four passengers are KIA. NAGATA MARU rescues survivors. Sulu Sea. Gulf of Rianga. 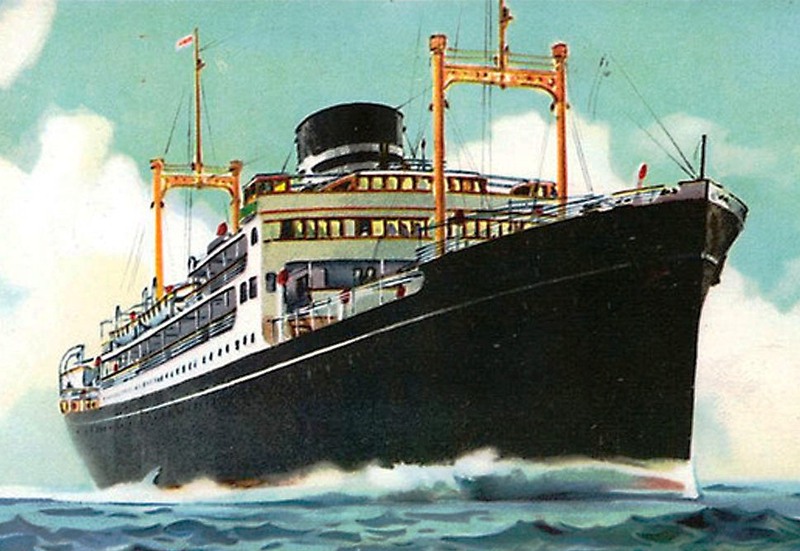 At 0250, Weiss torpedoes and sinks CHOJO MARU at 08-30N, 126-58E. 748 soldiers and sailors, three armed guards, 17 gunners, 15 lookouts and 72 crewmen are KIA.